With the summer season coming to an end and the brisk fall weather turning its chilly front around the corner, there’s a few style keys to keep in mind. A Light Jacket – whether it’s a light nylon jacket or a heavier, but still light canvas jacket, you’ll want to have a go-to ready to throw on for chilly night. There’s a ton of options. Whether it’s a bomber jacket from Billy Reid or a waterproof, active jacket from lululemon, find something you’ll love and use often. Beanie – a simple accessories for those cold nights to keep your ears warm. It can also help you bright up a dull look, or make a statement if there’s a funky pattern or graphic on it. H&M is always a good go to, and then there’s also 1 Voice which makes a pair with built-in earphones! Hi-tops – a year round style, hi-tops will keep your ankle extra warm over their low-top counterparts. 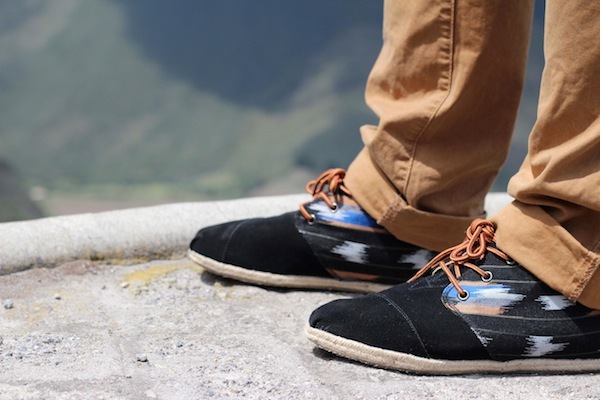 Converse is always good, but check out some water proof styles from the likes of Helly Hansen and color, patterned options from TOMS (pictured above). Denim – box up those shorts boys and pull out your best denim. Denim, for some reason or another, shines best in the fall. It might be the contrast with all that forthcoming foliage, who knows. All I know is denim jackets, pants, caps … whatever – they all look good in the fall. Shop Levi’s and Express for the basics, and Mavi and Baldwin for some luxe designs. For more tips, I recently started writing for BespokePost (the subscription box service and e-commerce for fresh and interesting products for men) and it’s blog, The Post, and chat more about chat about transitional style to keep in min this summer to fall season. Visit here. Posted on September 22, 2015, in Fashion, Shopping and tagged Express, Fashion, Helly Hansen, lululemon, Men's Fashion, Menswear, Style, Toms. Bookmark the permalink. Leave a comment.